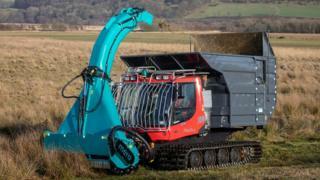 A machine designed to harvest the wettest bogs is to be used to restore some of Wales' most important wildlife habitats. The 4.5 tonnes mower - dubbed the "Monster Mower" - will be used to treat peat land in Ceredigion that has grown for over 12,000 years. Restoring it will help fight climate change as new peat will lock in more carbon, Natural Resources Wales said. It will also improve the water quality of local rivers. Raised bogs are home to rare plants and animals, but have deteriorated as invasive plants moved in. Purple moor-grass dominates some parts of raised bogs due to previous drainage - it smothers the special bog plant species and stops sphagnum moss from growing. Over the course of the project, it is intended that the machine will cut at least 75 hectares of purple moor-grass, which equates to 75 rugby pitches. The machine, which measures over 3m high, will be at bog sites Cors Caron, near Tregaron, and Cors Fochno, near Borth, for the next four years. Rhoswen Leonard, Life Welsh Raised Bog project officer said: "The machine itself is amazing. "The wide tracks mean it can float on the peat bog and reach areas that have been inaccessible in the past, and all without damaging the spongy mosses that make the site so important. "We can't wait to get started. "Once the project is complete the machine will be used by NRW (Natural Resources Wales) to restore other similar sites across Wales." All of the work carried out under this contract will be on Special Areas of Conservation - environmentally sensitive sites legally protected for their environmental interest. Harry Kester, of Off-Piste Agri Ltd, the UK dealer for the machine, said: "This versatile machine can work on several terrains. "Its wide tracks ensure it can operate on environmentally sensitive and wetland conditions, making it the perfect choice for conservation restoration projects like this."